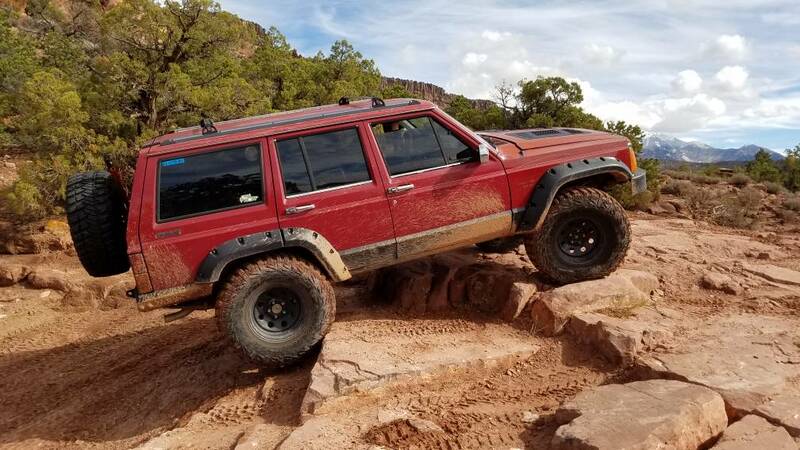 We had only 3 XJs on Steelbender on weds. It was a great day myself,Casey and Aaron. Amazing weather and another great trail in moab. So close to KOA camp ground. I tried the wall a few times but in the wett conditions the normal line didnt work. Aaron tried the riding up the crack on the wall and it worked. We ended up going bypass on tha fall. Due to none of use having any Moab experience. Played it safe and we all had a great day. Thanks for letting me tag along with you guys. I had a great time with you guys. I'll be getting to the pictures Gerilyn took this week. So I'll have some links up next week for pictures for you guys. Thanks for getting me up the wall. We'll have to do this again and make it down the drop! Plus I'll bring my own air next time. Haha. No worries Aaron. Come up and wheel anytime. Feel free to use my place in Sac as a base camp before starting a Rubicon trip. I look forward to having you spot me into the side of a cliff in the future. Haha. I thought you were kidding when you said this was only your second wheeling trip your spotting and driving ability fooled me.